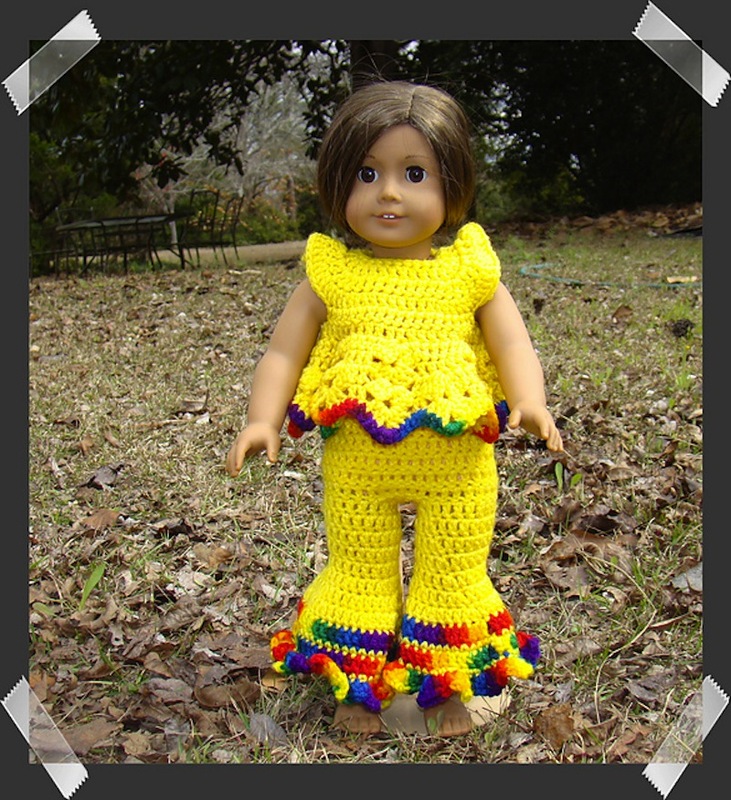 When we were much younger and had just learned how to crochet, one of the very first kinds of projects we learned how to make completely was doll clothing! That’s definitely not to say, however, that all doll clothing is simple or easy to do. 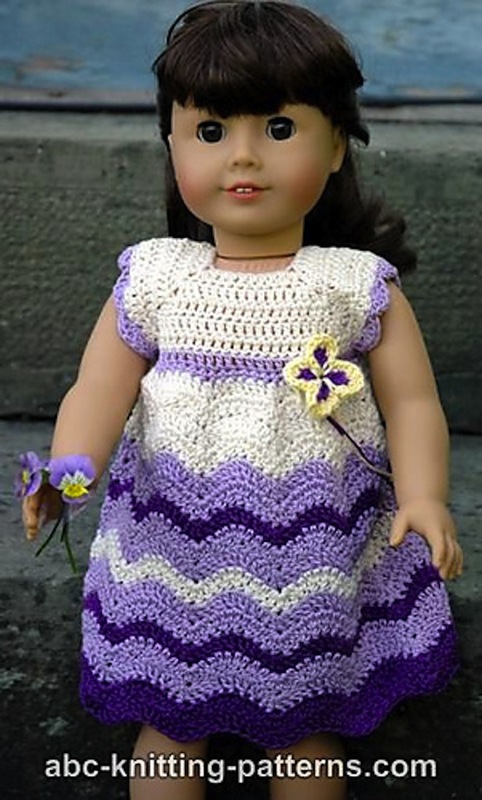 While some of it is great for beginners, we have since discovered that there are plenty of intricate doll clothing patterns for more experienced crocheters as well. That’s part of the reason they remain one of our favourite projects to do as time goes on. 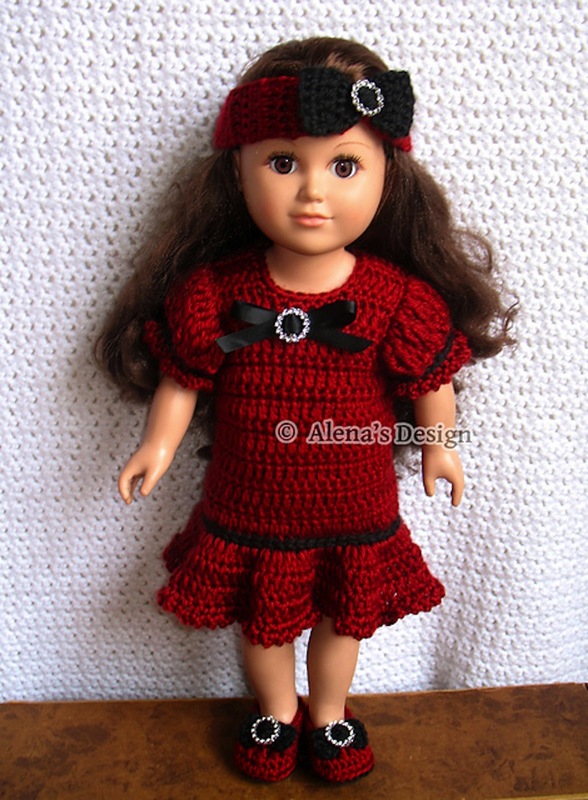 Check out these 15 stunning crocheted doll outfits that make wonderful gifts for the kids and collectors in your life! This beautiful pattern by Amy Carrico is a complete set featuring a dress, and beret, and little booties, and what’s better than a whole look in one project? As you can tell by the name, this pattern was titled after the original design, which was made in the pretty purple you see here, but that doesn’t mean you couldn’t make it in other nice colours too! Have you always been a fan of casual lace tunic dresses on actual little girls while they go about their days in warm summer weather? Then why not make your favourite little girl’s dolls a set of pretty dresses to match? This pattern by Alena Byers is simple enough to be a good introductory pattern to crocheted lace for those who are just learning, but it’ll still be very impressive in the end! Do you know a little girl or a doll collector who loves Disney more than anything else in life (except dolls, of course)? 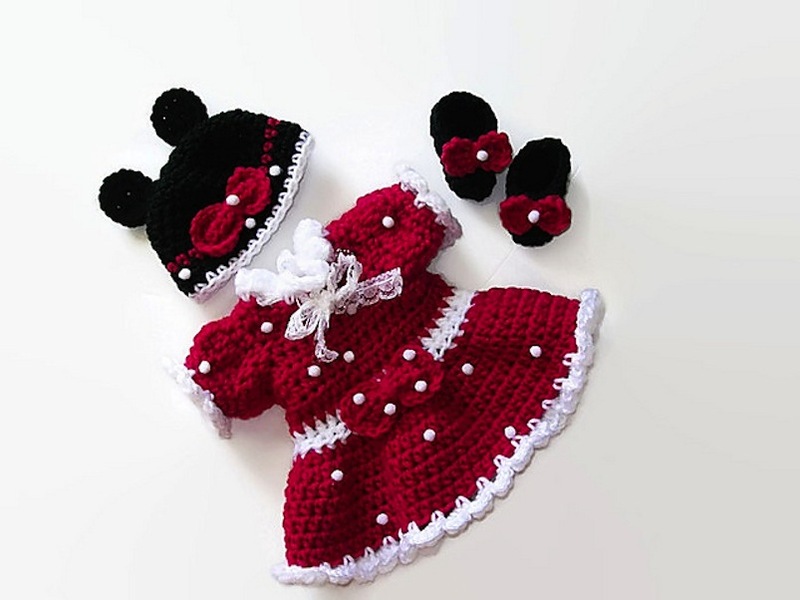 Then this adorable Minnie Mouse inspired outfit is the perfect gift for them! Wanetta Cavanaugh guides you through the process of making the outfit and the mouse ears hat, as well as an adorable pair of matching doll slippers to tie it all together. 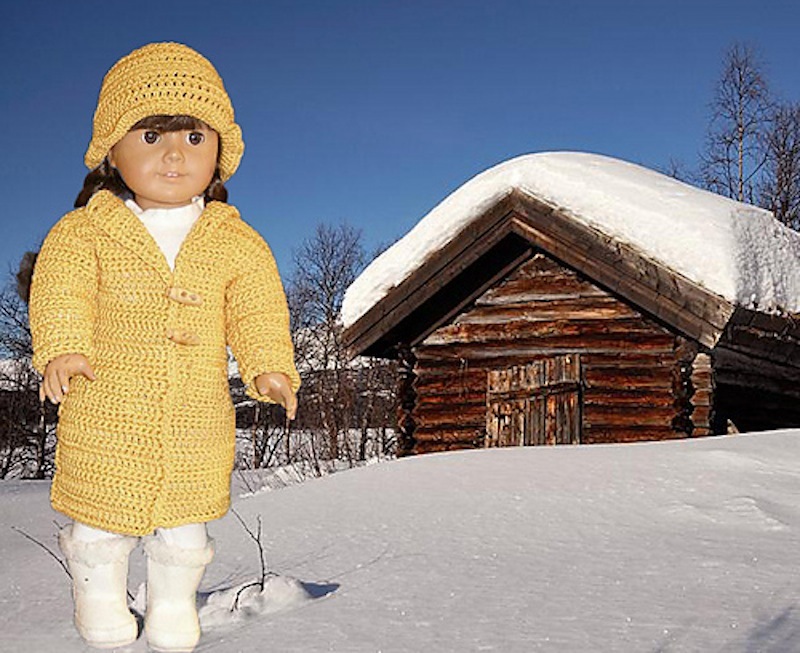 Just like real little girls need clothing for all weather days, so do their dolls! That’s why Ase Bence designed this adorable rain coat and hat set! It’s sized for an average sized American Girl doll, which makes it a versatile pattern both because those dolls are so popular right now, and because it’s quite an average size for many different brands of doll. Ponchos are the kind of clothing item that we’ve crocheted obsessively in the past, and in all sizes. More than once, we’ve crocheted brightly coloured ponchos with little flowered embellishments for our daughters and nieces and then used the leftover yarn to crochet their dolls a matching poncho too! 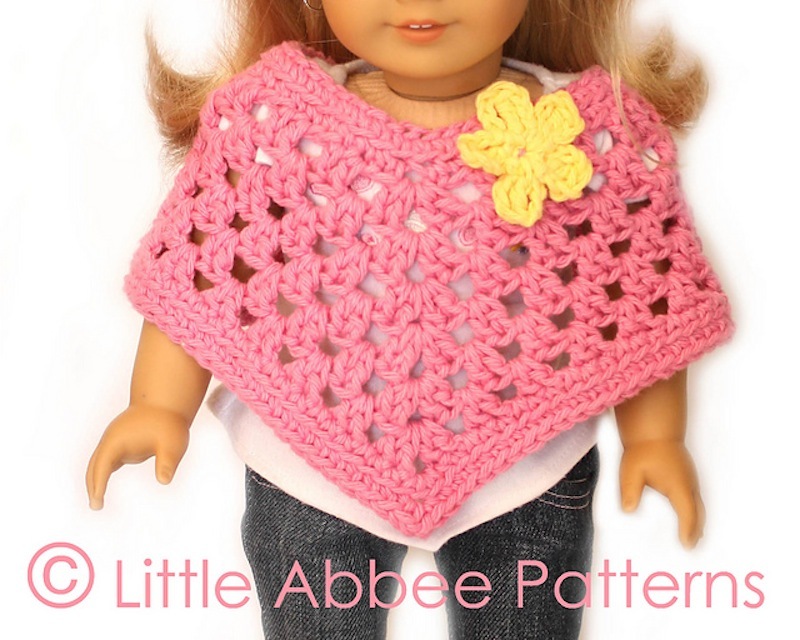 Nearly every time, we’ve used this adorably simple doll poncho pattern by Bailee L. Wellisch. If you’re anything like us, then you’ve long known how funny it is to make little kids silly novelty hats in all kinds of shapes and themes and then enjoy the sight of them wearing the hats in public. There aren’t many years, after all, that your kids will let you dress them in things like ridiculously attention grabbing hats shaped like farm animals! It makes sense, then, that it’s also funny to make novelty hats in miniature for your kids’ dolls. 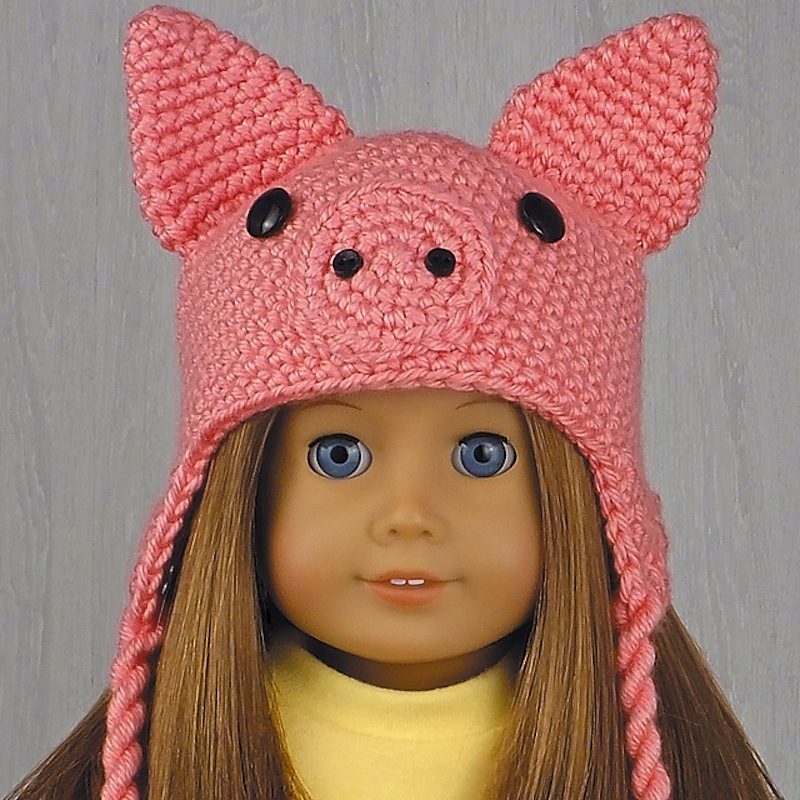 Here’s a cute little crocheted pig hat doll pattern from Linda Wright! Has your daughter, granddaughter, or niece been begging for a puppy for many months now but you’re just not sure she’s ready? Well, if she can’t have a real puppy, maybe she’ll be appeased for a little while by a puppy for her favourite doll instead! 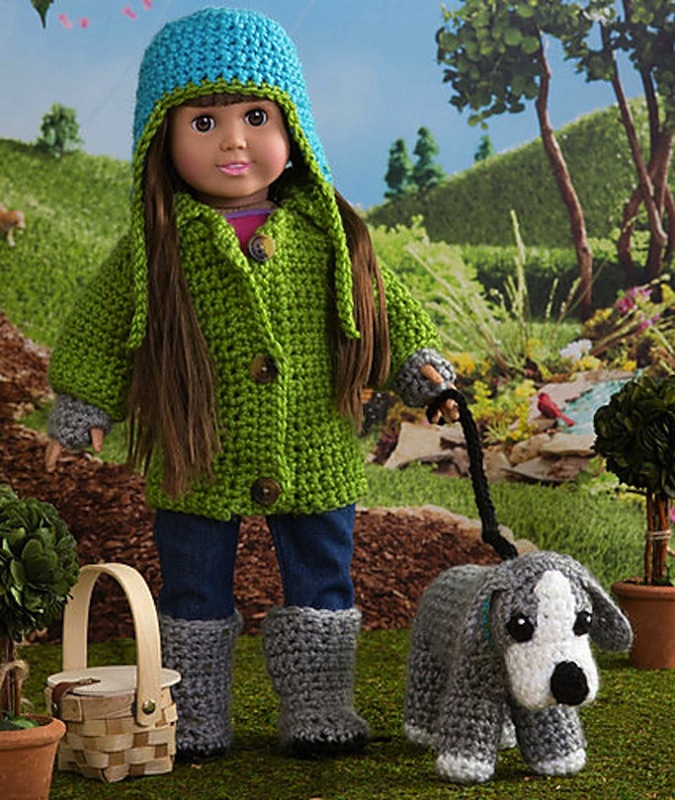 Rebecca J. Venton shows you how to make a complete talking walking outfit and the matching dog for a standard sized doll. We absolutely adore getting our daughters all dressed up in flashy seasonal outfits around the holidays, but we’re not really sure that they enjoy wearing those outfits as much as we enjoy taking pictures of them wearing them. That’s how we got into the habit of crocheting their favourite dolls matching holiday dresses each year. This pattern from Alena Byers helped us convince our daughters to put on their latest frilly garment more than once, as long as their dolls could match them. Did you really like the idea of making a cute little doll poncho, but you’d rather a subtler, more Boho chic style than the bright, lacy one we showed you above because you think that would be more the doll owner’s taste in their own wardrobe? Then check out this cute turtleneck version from Angela Plunkett! We love the way the little buttons look all down the sides. Category is: more funny doll hats! Just like your daughters, granddaughters, and nieces have parties to celebrate their birthdays, so too should their dolls! 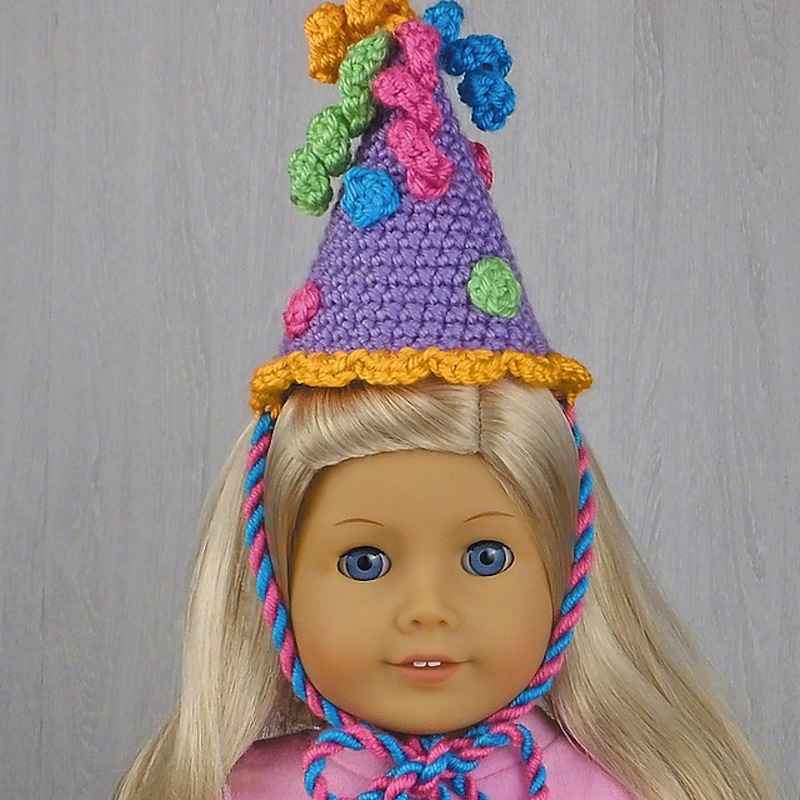 In the very least, they’ll love the idea of their dolls having a party hat to wear when they take them along to an actual friend’s birthday party, that way everyone in attendance is dressed for the occasion. See how this adorable hat is made on Linda Wright. 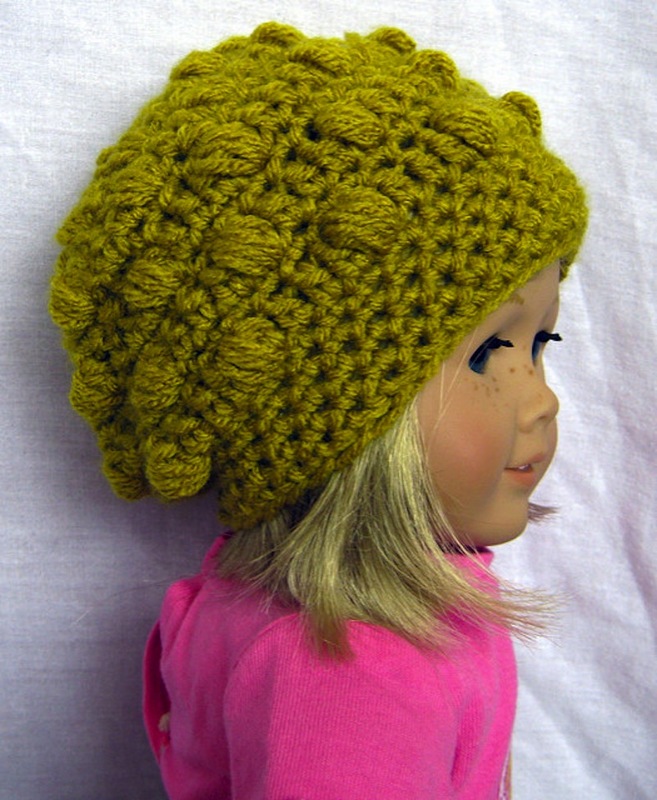 Slouchy toques and winter hats are the height of fashion in cold weather apparel right now, and since most little girls want to dress their dolls up to look just like them, it makes sense that they’d love a doll-sized slouchy hat to go along with their own! This pattern from Shauna Gailbraith is quick and easy but absolutely adorable when it’s finished. Sometimes making clothing for dolls is a nice opportunity to make overly sweet designs that your own daughter might not be willing to wear herself, but would be more than happy to dress her favourite dolly in. That’s how we see this adorable cupcake dress with matching skirt and hat from Susanne Fagelberg! Our daughters are a little bit too old to let us put them in such cutesie garments, but their dolls will wear anything. Have you been trying to teach your daughters about decades and how styles change over time in order to introduce them to fashion and history in a friendly, interesting way? Then why not use their dolls as the models for what they’re learning about? This adorable little hippie outfit might be a bit of an exaggeration on what was cool in the 1960s, but when it comes to how kids imagine things, its not far off. Check it out in all its glory on Maria Wilkes! Maybe you’re just learning how to do differently shaped stitches, small garment shaping, and colour changes all in one place, so you’ve been browsing this list hoping for a simple dress that’s standard in technique but still pretty? Then Elaine Phillips has the one for you! We adore the way the chevron pattern on the skirt looks in different shades of the same colour. 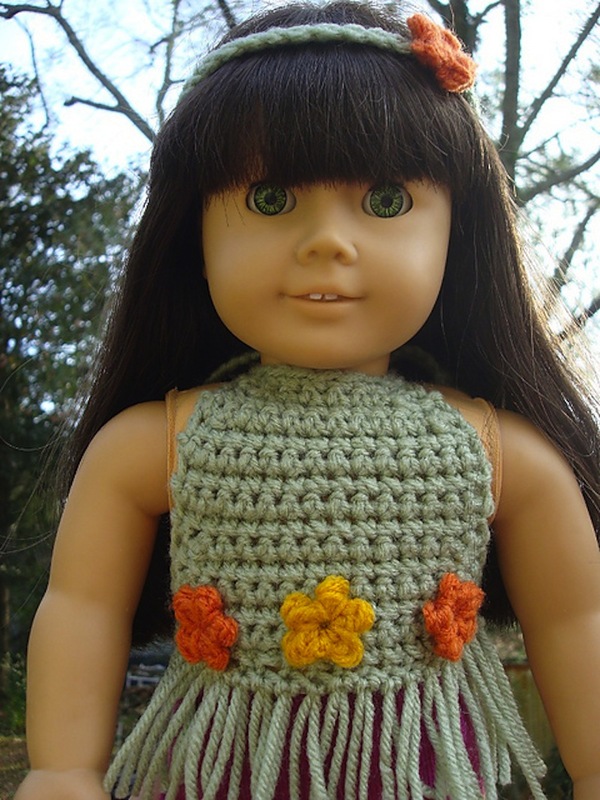 Did you like our idea about making your kids’ dolls outfits of different styles from different decades, but you’d rather try something a little less wild to show them how people dressed around the 60s? Then try making them this Boho chic fringed halter top by Charlotte W. instead! Just keep in mind that this thing is so darn cute you’ll probably have your kids begging for a bigger version of their own to wear when they see it. 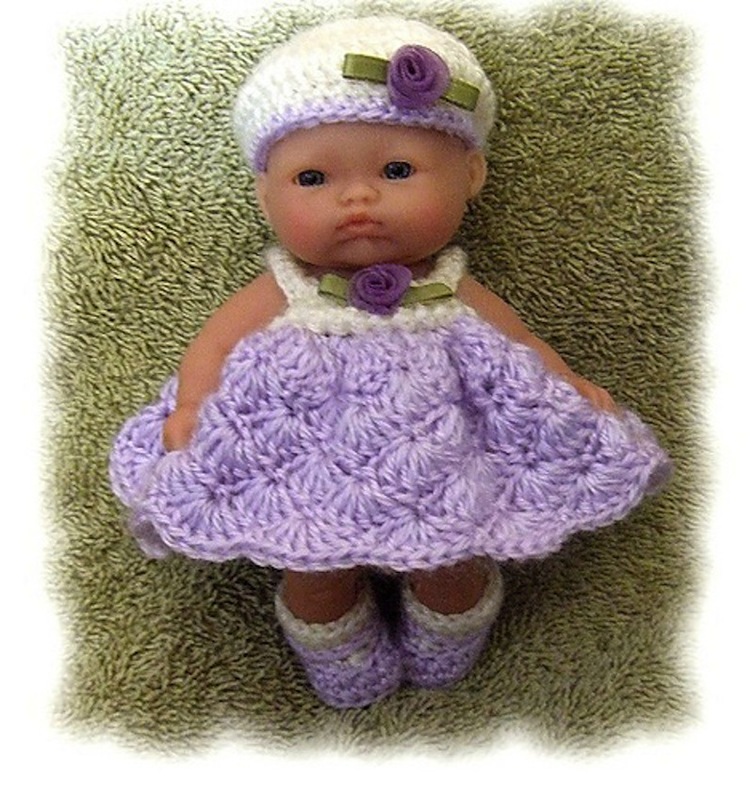 Have you made other crocheted doll clothing patterns that you were very happy with but that you don’t see on our list? Tell us how you did them or link us to the pattern in the comments section!